A guard reads an issue of The Denver Post. The Denver Post is a newspaper produced in Colorado, USA. A guard is reading an issue of The Denver Post inside the Cheyenne Mountain Complex. 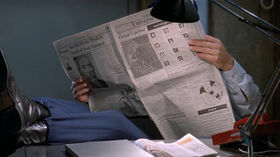 When Daniel Jackson comes into the room to take water to make coffee, he notices a picture of Orion on the newspaper. He suddenly grabs the sheet and rushes to the cartouche room. Taking a marker, he draws the connections between the stars and compares the sketch with one of the cartouche's symbols. They match. The title of the newspaper is visible only on the Blu-ray version of the movie, thanks to the high screen resolution. It is blurred on the DVD version because of the lower resolution. The Denver Post is a "real-world" daily newspaper. It has been founded in 1892. …and compares it with one of the symbols of the Giza cartouche: they match. Facts about "The Denver Post"
This page was last edited on 6 March 2015, at 13:16.